The first bank, namely Bank of Bombay took establishment in 1720 in Bombay. Later on, Bank of Hindustan took establishment in Calcutta in 1770. General Bank of India took establishment in 1786. Bank of Hindustan is on the business till 1906. First Joint Stock Bank with limited liability established in India in 1881 was Oudh Commercial Bank Ltd.
East India Company established the three independently functioning banks, also known by the name of “Three Presidency Banks” – The Bank of Bengal in 1806, The Bank of Bombay in 1840, and Bank of Madras in 1843. These three banks were there in 1921 and they gave a new name as Imperial Bank of India. After Independence, in 1955, the Imperial Bank of India took the name “State Bank of India”. The establishment took under State Bank of India Act, 1955. The first bank with fully Indian management was Punjab National Bank Ltd on 19 May 1894, in Lahore (now in Pakistan). The number of banks in India in 1951 was the highest – 566. In 1960, RBI gave a notice to merger the weak banks with the strong ones. This led to the reduction in the number of banks to 89 in 1969. On April 15, 1980, another six banks were nationalized and thus raising the number of nationalized banks to 20. A scheduled bank is listed under schedule II of the RBI Act, 1934. 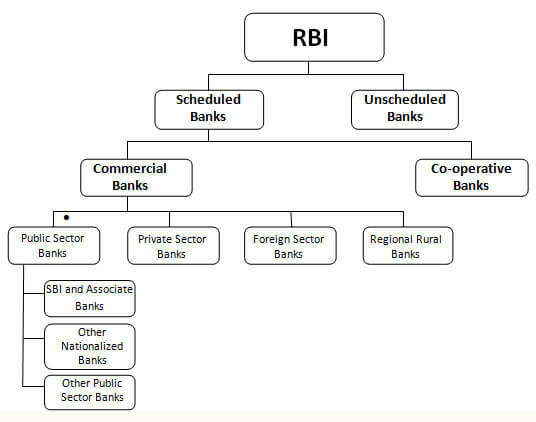 In order to be included under this schedule of the RBI Act, banks have to fulfill certain conditions such as having a paid up capital and reserves of at least 0.5 million and satisfying the Reserve Bank that its affairs are not being conducted in a manner prejudicial to the interests of its depositors. Scheduled banks are further classified into commercial and cooperative banks. Non- scheduled banks are those which are not included in the second schedule of the RBI Act, 1934. At present these are only three such banks in the country. Commercial banks may be defined as, any banking organization that deals with the deposits and loans of business organizations. They issue bank checks and drafts, as well as accept money on term deposits. They also act as moneylenders, by way of installment loans and overdrafts.Commercial banks also allow for a variety of deposit accounts, such as checking, savings, and time deposit. These institutions are run to make a profit and owned by a group of individuals. Scheduled commercial banks (SCBs) account for a major proportion of the business of the scheduled banks. SCBs in India are categorized into the five groups based on their ownership and/or their nature of operations. State Bank of India and its six associates (excluding State Bank of Saurashtra, which has been merged with the SBI with effect from August 13, 2008) are recognised as a separate category of SCBs, because of the distinct statutes (SBI Act, 1955 and SBI Subsidiary Banks Act, 1959) that govern them. Nationalised banks and SBI and associates together form the public sector banks group IDBI ltd. has been included in the nationalised banks group since December 2004. Private sector banks include the old private sector banks and the new generation private sector banks- which were incorporated according to the revised guidelines issued by the RBI regarding the entry of private sector banks in 1993. Foreign banks are present in the country either through complete branch/subsidiary route presence or through their representative offices. These are banks majority of share capital of the bank is held by private individuals. These banks are registered as companies with limited liability. 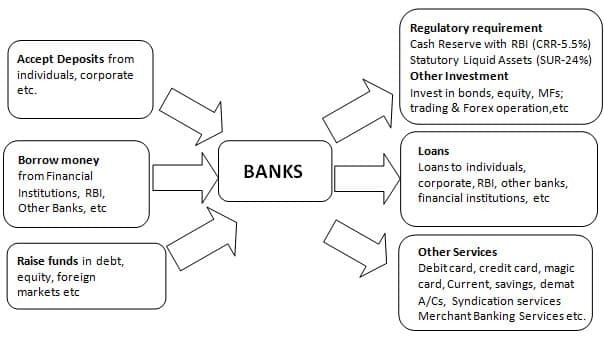 Examples of private sector banks are: ICICI Bank, Axis bank, HDFC, etc. A co-operative bank is a financial entity which belongs to its members, who are at the same time the owners and the customers of their bank. Co-operative banks are often created by persons belonging to the same local or professional community or sharing a common interest. On the suggestions of Narasimha Committee, the Banking Regulation Act was made some changes in 1993 and the gates for the new private sector banks were open. In 1993, New Bank of India got combine with Punjab National Bank. Industrial Development Bank of India (IDBI) took establishment as a Development Bank in 1964 by an act of Parliament. It was given the status of a scheduled bank in September 2004 by RBI. Bharatiya Mahila Bank Ltd known as all women’s bank took establishment in 2013. It is in New Delhi. Its first branch started its operations on November 19, 2013. Indian Prime Minister S. Manmohan Singh made the Inauguration. RBI is India’s central banking institution, which controls the monetary policy of the Indian rupee. RBI started its operations on 1 April 1935. The RBI has 21-member Central Board of Directors. They are the Governor, 4 Deputy Governors, 2 Finance Ministry representatives, 10 government-nominated directors and 4 directors to represent local boards headquarters at Mumbai, Kolkata, Chennai and New Delhi. The Government of India appoints the directors for a 4-year term. The concept of RBI depends on the guidelines by Dr Ambedkar to the “Royal Commission on Indian Currency & Finance” in 1925. Dr B. R. Ambedkar’s book “The Problem of the Rupee- Its origin and Its Solution” is made as a reference tool. The RBI was also known as Burma’s central bank, excluding the years of the Japanese occupation of Burma (1942–45), till April 1947. After Partition of India, the bank served as the central bank for Pakistan until June 1948 when the State Bank of Pakistan commenced operations. In 1949 the RBI got a green signal to be a national bank. Saving accounts can open by individuals in banks to save some share of their earnings. These savings accounts are open in the name of individuals only. On saving the account, an individual earns some rate of interest, these rates of interest vary for each bank. The current account is opened for business transactions, in the name of firm or company. Banks offer no rate of interest on money held in current account but provide extra features like no limit on deposit or withdrawal. Recurring Deposit Account or R.D. A recurring deposit account is a saving feature that bank offers to their customers. who can save the only small amount of money per month. In recurring deposit account, a person deposits a fixed sum of money for a fixed period for which the bank pays interest every month and pays back the money with the interest at end of the term. In fixed deposit account, a person deposits a fixed sum of money for a fixed period. The bank pays interest on the deposit account based on the time period of deposit. After the completion of the period, the bank pays the amount along with the interest earned. FCNR stands for Foreign Currency Non -Resident account. This account is opened by NRIs. An Individual invests a fixed sum of money for a period of minimum one year and maximum five years in any foreign currency in FCNR account. After the completion of a period, principal and interest is paid in foreign currency in which they the deposition is made. The Non-Resident Ordinary Account (NRO Account) is a Savings / Current /Recurring Deposit / Fixed Deposit bank account held in India, in Indian Rupees. NRO account can open by any person outside India if he wants to earn an attractive rate of interest in India and also have some earnings in India. Deposit / Fixed Deposit bank account held in India, in Indian Rupees. NRE account can open only by the NRIs. With effect from March 1, 2014, interest rates offered by banks on NRE deposits cannot be higher than those offered by them on comparable domestic rupee deposits. It is a central payment system, through which interbank payment instructions will take the process and settle in real time on Gross basis. It is a nation-wide fund transfer system which facilitates fund transfer from any bank’s branch to any other bank’s branch. The difference between NEFT and RTGS is that NEFT settlements happen in batches, and on net settlement basis whereas RTGS is real time and gross settlement. It is a payment system which uses Aadhar card number and an individual’s online UIDAI authentication, which will have a link to a customer’s Bank account. A customer should register his/her Aadhar number to their existing bank account, providing their bank is AEPS enable. Through AEPS, the customer can withdraw or deposit cash, make a balance enquiry, and transfer funds. It is a system of money transfer for transferring personal remittances from abroad to beneficiaries in India. Only inward remittance into India is permissible. The cheque owner is responsible for withdrawing the Bearer Cheque. These types of cheques are normally useful for a cash transaction. Order cheque is the cheque that the payee will be withdrawing. A crossed cheque is a cheque that is a mark to specify an instruction. A common instruction is to specify that it must be deposit directly into an account with a bank. The writer can protect the cheques from being stolen by crossing it. Adding a crossing to a cheque increases its security. In that, it cannot be cash at a bank counter but must be paid into an account in the same name. which appears on the ‘payee’ line of the cheque. If a holder issues a cheque to the payee which will not be withdrawing from the bank till three months, then that type of cheque is stale cheque. If a holder issues a cheque to the payee for the upcoming withdrawing date, then these are the postdated cheque. It is a medium of exchange that we can use in place of hard currency. They can be deposited in any world currencies and are pre – printed. People can use this on vacation in foreign countries without using cash. The article on banking awareness 2017 will help you in gaining more knowledge. Make important notes on the banking and financial awareness which will help for better score in all exams.